With the greatest respect towards anyone who has written about this subject in the past, I believe the perpetuating existence of the Remembrance Poppy Day within the British Commonwealth countries (formerly ‘Empire’) should be credited to one person alone. Of course, rightly so, Canadian John McCrea exists at the heart of every historical account. The physician from Guelph, Ontario who immortalised the poppy when he wrote his 1915 poem ‘In Flanders Fields’ (whilst serving as a CEF artillery officer in Belgium) has given inspiration to so many. But, for me, the French woman Madame Anna A. Guérin is the most significant personality. She saw the potential of the poppy emblem to help her belle France and those who had survived the First World War, alongside the remembrance of those who had lost their lives in it. What singles her out is the fact that her dynamic personality drove forward the campaign … where she led, so many others followed. 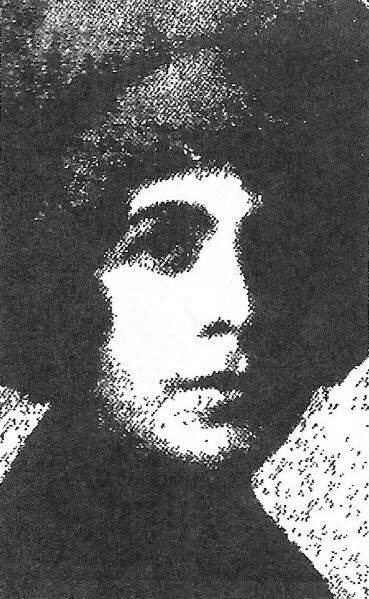 Poppy Lady Madame Guérin: Image edited from the 09 November 1921 edition of The Toronto Star, Page 21. Even in the United States of America, where it appears the poppy (as a remembrance emblem) is not being embraced to the same extent as in the other First World War Allied countries, I believe Madame Guérin should be given credit for any person found wearing the poppy as a memorial symbol there today. There are numerous accounts of the ‘Remembrance Poppy’ story-line and its participants, together with many conflicting interpretations of events plus countless firm opinions on the subject. Always, Canadian Physician Major John McCrae and his 1915 poem ‘In Flanders Fields’ are documented first. Next, in the sequence of events documented by others, U.S-born Miss Moїna Belle Michael will be cast as the main player in originating the poppy emblem. One Mrs. Mary Hanecy, of Milwaukee, is occasionally given a walk-on part. Lastly, French woman Madame Anna Guérin gets a mention (if she is lucky) but she is usually given the role of Miss Michael’s understudy. Whenever and wherever Anna Guérin & Moїna Michael are mentioned together, Miss Michael is usually credited with Madame Guérin’s involvement in the ‘Remembrance Poppy’ timeline. In fact, people could be forgiven for believing that Madame Guérin actually commandeered the whole idea from Miss Michael and Madame Guérin was inspired by her – such are the inferences made. But I have discovered evidence that will, hopefully, encourage people to think differently. You may have seen the name “Madame Guérin” written but never will you have known who she really was – until now! I have discovered Madame Guérin’s achievements and uncovered her true identity and life. In my amateur way, the aim is to demonstrate that she was no understudy and that she, the “Poppy Lady from France”, should be written about more often and be given more credit than she receives at the moment. Anna married young; soon became a mother of two daughters; and ran a school in a French colony for approximately twelve years. She was very determined that indigenous girls should reach their full potential. In time, Anna was given the awards l‘Officier d’Académie (Silver Palms); l‘Officier de l’Instruction Publique (Golden Palms); and, reportedly, l’Ordre du Nichan for services to France. She was awarded a ‘Victory Liberty Loan Medallion’ for her services to the United States of America … for campaigning work during 1917 and 1918. Fate decreed that Anna divorced; remarried; and became “Madame E. Guérin” – she would become known as the “Poppy Lady of France” or “Poppy Lady from France”. Whilst her JP husband carried on his judicial duties in Africa, she went to Great Britain and lectured there for approximately 4 years – under the auspices of the ‘Alliance Française’ organisation. Her two daughters were schooled in London for a while. She went to the USA soon after World War One broke out in 1914 – initially, as an ‘Alliance Française’ lecturer. She was passionate about the French culture and language; and education. Once in the USA, Anna covertly raised funds for France and the Red Cross and, once the country entered the War, she lectured at thousands of First World War patriotic ‘drives’. In the USA, she was a formidable fundraiser during and after the First World War – for the war effort and for France. She was called “the greatest of all the war speakers”. She had an enviable, dynamic presence e.g. she could canvass areas just recently canvassed by others and bring in thousands more dollars. Contemplating that era, I believe that many who read ‘In Flanders Fields’ or saw the fragile poppy growing on the First World War battlefields were emotionally moved contemporaneous with each other but I believe it was fate that Madame Guérin was there to work her magic with the symbolic bloom and take the poem’s sentiments further … to a different dimension. On 21 August 1915, a “Poppy Day” was held at South Shields, England, in aid of the town’s Ingham Infirmary and local Poor Children’s Association – it raised £191 0s 4½d. The Infirmary has been found to treat the odd First World War serviceman. 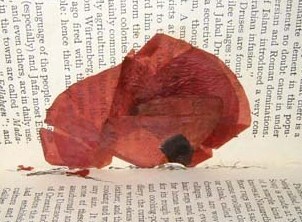 In 1916, artificial poppies were distributed in England for charity. For example: in May, the St. Michael’s War Work Party, in South Shields, held a Poppy Day “IN AID OF THE BRITISH AND RUSSIAN PRISONERS OF WAR” for ‘The Prisoners of War Fund’; in August, the Sleights Red Cross Hospital, on the Yorkshire Moors, held a Poppy Day in Whitby – to raise additional funds for their Hospital’s war effort; and, later in August, there was a Poppy Day in Nottingham to benefit orphans. Picked by a British Private in the Labour Corps Regiment. Copyright held by the family of that British Private. In the U.S.A., as early as April 1918, American women gave out poppies in New York after accepting war effort donations. Who is to say what emotions were felt when people exchanged their money for those early poppies, on both sides of the Atlantic … was it in remembrance of a loved one recently lost? We will never know, because those emotions were kept to themselves. Anna gave out boutonnières in September 1918 (for her, boutonnières were always poppies) – in exchange for money for “fatherless children in the devastated regions of France”. For all her US Poppy Days and Drives afterwards, Anna would visit a town; hold a lecture; and enlist the help of local women. Women and girls were the back-bone of her campaigns. Given details discovered about her, the young Anna (a passionate, free spirit) became a very independent and motivational woman who inspired everyone who heard her. I feel she was the person inspiring others, rather than her needing inspiration herself. 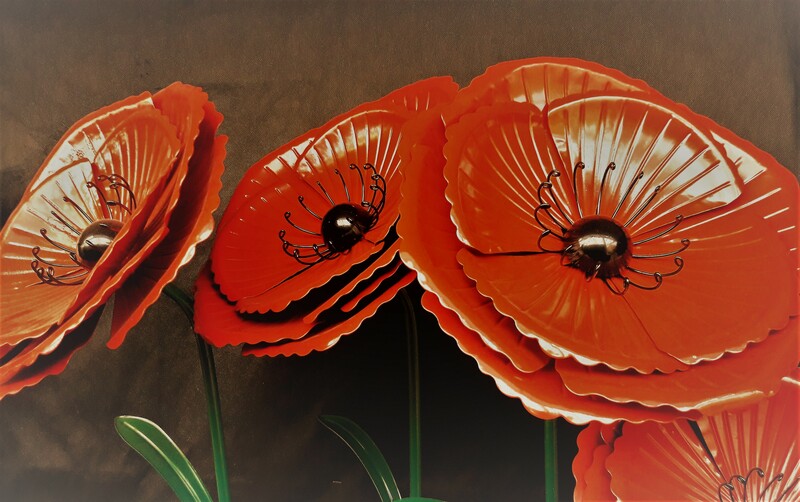 In September 1920, fate decreed that the American Legion was the first of the First World War inter-allied veterans’ groups to adopt the poppy as a remembrance emblem – after Madame Guérin was invited to speak about her ‘Inter-Allied Poppy Day’ idea at their convention. The American Legion and its women’s Auxiliary supported Madame Guérin in her charity’s official U.S. ‘Poppy Day’ on 28 May 1921 – ahead of the country’s Memorial or Decoration Day on the 30th May. This was the first NATIONWIDE ‘Poppy Day’ ever. Veteran groups of the British Empire nations (the ‘Commonwealth’ today) followed. Canada’s ‘Great War Veterans Association’ was the first of these Empire groups and, as such, set an important precedent to all the others. The Empire’s first national Poppy Days began in November 1921, although New Zealand’s was held in April 1922. The ‘Veterans of Foreign Wars’ was the first US veterans’ group to organise a National Poppy Day in the USA, in May 1922. Given that the V.F.W. always remembers the part Madame Guérin played in the history of the Remembrance Poppy, it is always puzzling to the author that the American Legion always erases her from it! All this solely because of Madame Guérin and the people she inspired, I feel. To understand how Anna A. Guérin came to introduce the poppy as the remembrance symbol and came to promote her ‘Inter-Allied Poppy Day’ idea, you need to understand the woman herself and her achievements up until that point. With no hidden agenda or prejudice, I have offered personal conjecture where I cannot provide substantial proof. That said, there is a lot of proof backing up statements. I find it poignant that I have unearthed the Guérin story during the centennial year of John McCrae’s Canadian poem that inspired so many. I reveal a different version of events and hope to dispel some myths. I believe it was fate that a Canadian woman was responsible for enlightening me about Madame Guérin’s existence. I have a new-found loyalty to Madame Guérin and I hope to elevate her to her rightful position. I believe that Madame Anna A. Guérin is the true ‘Poppy Lady’ but Empire countries have all but forgotten her … I wish to make amends. It was difficult to decide where to begin the story of this unique woman, who was known as “The Poppy Lady from France” and “The Spirit of France Incarnate” in her lifetime. In the end, I elected to commence at the beginning and record her life chronologically thereafter. Bear with me, as I (an amateur author) share what has been discovered during my research.